Harold Allan Clarke (born 5 April 1942) is a retired English pop rock singer. 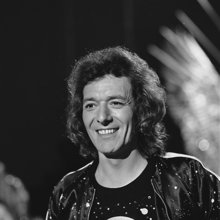 He was one of the founding members and the original lead singer of The Hollies. He retired from performing in 1999. He was inducted into the Rock and Roll Hall of Fame in 2010. ↑ "The Hollies". Rock and Roll Hall of Fame. 2010. Retrieved 13 March 2010. This page was last changed on 6 January 2019, at 20:18.